Africa is fast becoming a renowned destination with amazing tourist attractions with countries like Kenya, Tanzania, Egypt and South Africa making waves and creating a new era in tourism. For countries like Kenya, tourism contribute a very substantial amount to national revenue every year. Certain tourist attractions are popular because there is a special feeling it gives to people who visit such places and this is outside the fact that places like this hold a very rich heritage and recognition. There are a few places in Africa that are worth mentioning when it comes to Africa’s popular tourist destinations. Here are the Top 10 Well Known Tourist Attractions in Africa. The Omo River region is an area in the Southwestern Ethiopia and home to more than 50 different tribes. If you love African culture, you should pay this place a visit because of its huge cultural heritage. It is still a place in Africa where much of traditional customs and beliefs are very much intact for most of the tribes and this has made it an enchanting tourist attraction for those interested in African culture. The region is quite remote and is hardly accessible by vehicle. The warriors would often sling Kalashnikovs (riffle) slung across their backs. This can be a bit disconcerting but the tribes are friendly and this is often the only western accessory you’ll see them wear. Zanzibar, located in the Indian Ocean just off the coast of Tanzania, it is one of the top 10 Africa’s top tourist attractions, largely due to the fact that it has got a fascinating history and unbelievably beautiful beaches. It was one of the regions in Africa where the stone age was highly established and it became a wealthy and advanced region which consisted of many autonomous merchant cities. Zanzibar was well-known for spices and ivory and part of its history was that it was a major hub during the era of slave trade. The Stone Town of Zanzibar is a UNESCO World Heritage site and one of the island’s biggest tourist attractions, boasting of lovely traditional houses, narrow alleyways, a Sultan’s palace and many mosques. You’ll enjoy clear, shallow sandbars perfect for wading, turquoise-blue water; and many small, nearly deserted islands. The Mount Kilimanjaro has placed Tanzania for the second time, among the countries with exceptional travel attractions in Africa. It is the largest mountain in Africa and one of the best tourist attractions for adventure travel. It offers a dream mountain hiking and its dormant volcanic cones are probably nothing to be so worried about. If you would love to ascend to the highest point in Africa, get ready for mount Kilimanjaro which stands at 19,340 feet (5896m) and will take you 6 days to climb. There are about 700 mountain gorillas left worldwide and about 450 inhabit an extinct volcanic region called the Virunga mountain in Uganda, Rwanda and the Democratic Republic of Congo in East Africa while the remaining 350 or so inhabit a nearby area of Bwindi in Uganda. If you love a life of adventure that brings up challenges mixed with excitement then plan a trip to the Virunga National Park or Parc National des Volcans (PNV) which is located just in the North of the country encompassing its share of the mountain gorilla population. The park covers an area of about 46 square miles and encompasses six volcanoes. Virunga National Park has been a recognized UNESCO-designated World Heritage Site since 1979. Marrakech is the second largest city in Morocco. Located at the foot of the ice covered Atlas mountains, the imperial city of Marrakech is large and quite noisy. However, the great thing about the city is its enchanting and rich history. It is regarded as one of the most culturally rich places in Morocco. If you follow archaeology, you would know that numerous stone implements have been unearthed in the area; If you enjoy a daily assault on all your sense organs then you’ll have a lot of fun. There are certain locations that are a must visit if you find yourself in this city and they include places like: the Majorelle gardens or the gardens around the Saadian Tombs and the local farmers’ or flea market which may be a fun place to spend a Saturday morning. Have you ever thought of Cape Town as one of the tourist attractions in Africa? Cape Town is one of the most beautiful cities in South Africa. It is home to the well-known Blaauwberg Beach and Kirstenbosch National Botanical Gardens are within a short driving distance within the city. The beautiful and amazing Cape of Good Hope Nature Reserve provides wildlife encounters, sweeping sea vistas and hiking trails for hikers. You can crown your holiday by visiting the Robben Island, the prison where Nelson Mandela was held for 27 years before he was released to become the South African President. Djenne town is one of the oldest cities in Mali and quite an interesting place full of mud-brick homes decorated with paint. Established at around 800BC, Djenne was a major market hub but it does not just end there. 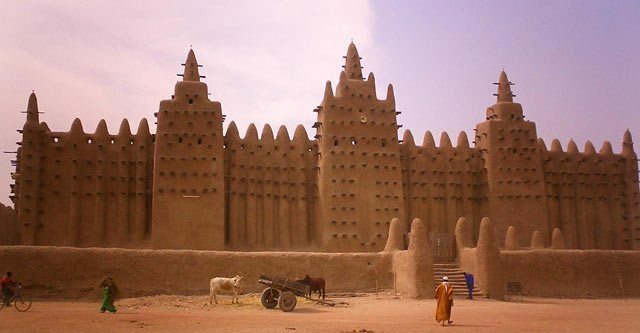 If you want to experience creativity with mud, you should travel to Djenne. It is the location of the largest mud house in the world: The Grande Mosque. Made from mud with wood sticking out of the walls, it is a magnificent sight. The Grand Marche is a Monday market and is one of West Africa’s most colorful markets with thousands coming from all over the region to sell their goods. One of the major and most popular travel destinations for tourists is found in Kenya. The Masai Mara National Reserve Kenya is known as Africa’s Greatest Wildlife Reserve. The region is home to lots of African lions and the Masai people. With 570 recorded species of birds, 95 species of mammals with more than 2 million Wildebeest, Zebra and Thomsons Gazelle annual migration, this is definitely one of the places to be in Africa and July to October is the season of the year you would not want to miss as this is when most of the animal migration are witnessed. At the southern part of Africa; between Zambia and Zimbabwe is one of the major natural wonders in Africa and one of the 7 wonders of the world. The Victoria Falls is practically the largest waterfall in the world. This recognition comes from combining the height and width together to create the largest single sheet of flowing water. The Falls is best viewed from the Zambian side and between June and July. This is because at the heart of rainy season, it is nearly impossible to see the base of the Falls. Some of the activities you can engage in while at the Victoria Falls include hiking or walking the trails along the top of the Falls and across the gorge. These trails give you a face to face view of the falls and follow the falls all along the opposite side of the gorge. If you have been to Egypt, you would definitely have been to see the The Pyramids and the Sphin. It is one of Egypt’s top tourist attractions. The Pyramid was said to have been constructed between 2589 BC and 2504 BC, there is still no known fact about how the construction was carried out. The last surviving of the Seven Wonders of the World is the Great Pyramid of Giza. There are three main pyramids in Giza; the Great Pyramid of Khufu (or Cheops), The Pyramid of Kafhre and the smaller Pyramid of Menkaura and each pyramid was used as a tomb for one of the Pharaohs of Egypt. In front of the pyramids lies the Great Sphinx, this enormous cat-like sculpture has mesmerized millions of visitors. The Great Sphinx or as the ancients knew it, “Shesib Ankh” or “the living image”, has to be one of the most recognizable constructions in history.